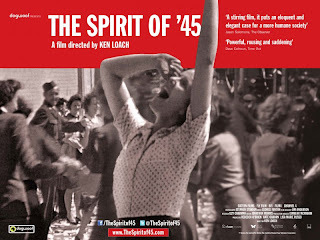 In the same way that going to see Evil Dead the day Margaret Thatcher gave me a chuckle, it seems strangely fitting that the day after they bury her with pomp and circumstance many feel was unwarranted I should sit down and watch Ken Loach's documentary The Spirit Of '45. Many, and I'll nail my colours to the mast and say I am among them, feel that the socialist (not to be confused with communist) dream that was embarked on just after the war was dealt several killer blows once Mrs T got handed the keys to No10 in 1979. Ken Loach certainly does, but more of that to come. The birth of the National Health Service, council housing, free education, state-owned utilities and state-owned transport infrastructure is a cornerstone of our country's history, an it is this that Loach sets out to document here. And as you'd expect from a man with his back catalogue - he does a good job. The setting is clear and they style simple from the start. Using interviews with experts and people who lived through the times, inter-cut with archive footage of people living in the slums or celebrating the end of the war, Loach sets about explaining how bad things had been and how they led to the rise of the Labour movement. Essentially, people returned from the war determined to not return to the Britain of the 1930s - where, as one man puts it, the country was run by the rich for the rich. And the passion people felt then for a government promising housing and a free health service is still felt now as they recount what they lived through. Among the more compelling interviews (and that's not to take away from the others - one of the strengths of this film is the way Loach gets people to talk openly and honestly) is the man who watched a pit tunnel collapse on his mate. They could have put a prop up, but no one was paying them for that. They were paid to get the coal out, and the sooner the more likely they were to get a badly-needed bonus. The emotions he and his colleagues felt as Clement Attlee swept to a landslide victory is captured vividly. And the optimism that swept through the working classes was almost spiritual. Finally they believed someone was there to help them. And it is this that is at the core of Loach's film. As he details how the social revolution was implemented - from the Beveridge Report, through to the nationalisation of major industries and utilities - Loach captures how everyone was there for each other. There was a sense of community, society, togetherness. That the message that the State would care for you from cradle to grave was honest, heartfelt, needed and appreciated. That's not to say the whole movement was perfect, far from it - and Loach isn't one to shy away from covering the flaws in the system. The point is well made about the mining industry and how the tyrannical bosses of the privately-owned pits were deemed fit bosses of the new nationalised coal boards. Not something appreciated by the workers. For just over an hour, Loach perfectly captures the sense of hope that swept post-war Britain. He tells the tales of the squalor people lived in, and how that was changed. The sense of unity that brought people together, the fact people's health was no longer an economic decision. And then we jump to 1979 and the Tory election win. Which jars a weeny. Having put Attlee's win in perfect context, there is no explanation as to the feeling in the nation at the end of the 70s. Now, I was only six when that speech was uttered on the steps of Downing Street, but I've learnt enough over the years to know all was not rosy in England's garden. Industrial unrest was rife and people had had enough of not having their bins emptied (a simplistic view, but you get my point). What happened during the 50s and 60s is not mentioned. Do we assume all was well? The dockers get a nod with the end to the use of casual labour in the 60s, but that's it. We go from Attlee to Thatcher in the blink of an eye, and it's hard not to be left with the feeling that you've been shown a lovely painting and the person who vandalised it years later, but without context. And that's a problem, if you're after a fair and balanced piece. As I said, I'm on board with blaming her for fracturing society and creating a country where people just look after themselves - I saw this happening first hand - but, if you're attempting to show a balanced view of history (and lets not forget Ken is a BIG Labour supporter, so that's quite the 'if'), then you need to explain what led to the return of cash over a social conscious. Because there's no denying that money was at the core of Thatcher's three terms in office. She sold off everything she could lay her hands on, and deregulated many other areas in the interests of free enterprise. She put making money at the centre of policy, not caring for your fellow man. And that is something Loach is keen to stress. Having skipped through the years from The Spirit Of '45 to the aftermath of the spirit of Thatcherism, he again speaks to people who have been through it all - and in doing so, drives his point home. That at some point, society will start to mend itself, and again we will endeavour to once again care for each other. This may happen, it may not - but the belief of the people being interviewed is contagious. So, yes, the last twenty minutes of The Spirit Of '45 raises more questions than it answers, but despite this the film as a whole is humbling and uplifting in equal measure. To see how a nation can unite after a hard-fought war and work together - and take pride in each others' work - is a joy to behold. And it does give you hope for the future. I haven't seen this yet but look forward to getting the opportunity to do so. I'm generally a bit of a left-winger myself but that doesn't mean that I don't always have problems-free relationships with polemic features like this when they try and steer clear of balance.